For most children, the most difficult decisions during Halloween are what to dress as and exactly how much candy they can eat in one sitting. Parents, meanwhile, often have many more questions. 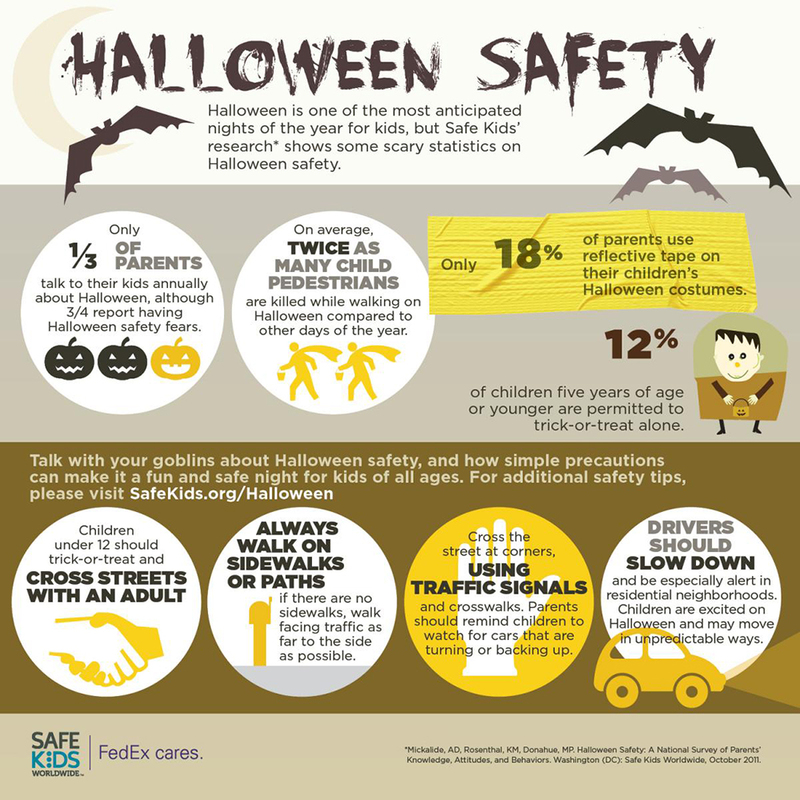 Children are more than twice as likely to be injured by a vehicle on Halloween than on any other day of the year. Encourage everyone to look both ways before crossing the street and to use cross walks! While it can be exciting to trick-or-treat and collect candy, make sure everyone walks door-to-door instead of running. Not only does this make it less likely to have someone run into the street, but it makes them less likely to fall or run into each other while out in new clothes in the dark. Have a plan of where you will be trick-or-treating in advance. This will let you check out the best route to walk while in daylight and make sure no one gets left behind or lost on Halloween night. Trick-or-treat in a group if possible, and make sure the group sticks together so no one is separated. It can be scary and dangerous for young children to get lost in the shuffle, and this strategy makes sure everyone has fun together. I recommend parents stay on the sidewalk together while children go up to each door and stand on the porch. It lets kids have independence but with an adult around to make sure they stay safe. Kids can have great imaginations when it comes to Halloween. Regardless of costume choice, make sure they fit well and let children move with ease. Long capes, robes, dresses or other fabric can tangle around shoes and feet. Keep costumes short and well fitted. A mask can sometimes make the costume, but a poorly made or ill-fitting mask can make it hard for children to see, breath or hear. If possible, use makeup as an alternative. If a mask is a must-have, keep it as small as possible, and make sure it doesn’t obstruct your child’s ability to see and breathe comfortably. Some costumes are darker in color by necessity (Darth Vader wouldn’t be nearly as impressive if he were orange). Make sure visibility isn’t lost at authenticity’s expense. If the costume must be dark, add reflective tape or lighter sections, or incorporate sources of light such as a flashlight or glow sticks as part of the look. This will allow children to see better and others to see them. I’ve yet to find a child who doesn’t want to wear a costume before Halloween, and I encourage parents to give in. Costumes can be big, bulky or just different from what a child normally wears. Allowing kids to get comfortable in their costumes ahead of time lets them learn how to move around, which is very important as they navigate steps and around pumpkins with candles. Teach your children to make sure their costumes don’t get tangled or caught in anything dangerous. While the dangers of poison, razors and needles in candy are overblown and unlikely, dangers still exist when collecting food from strangers. Before allowing your child to dig in, make sure all the candy is properly closed and doesn’t appear spoiled. Most importantly, remove any candy that may pose a choking hazard to young children or contain known food allergens. Although it is sometimes overlooked, some children enjoy being able to dress up and stay home to pass out candy and see all of the other costumes. Ask what your child might prefer. This often works well for those with multiple children and different age ranges. 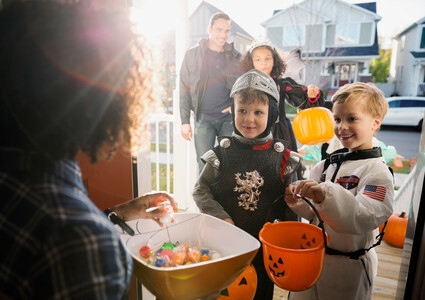 One parent or family member can stay home with one child to pass out candy while the older child trick-or-treats with the other parent, a friend or a family member. Halloween can have its scary parts for parents and children. But with a little planning and foresight, everyone can have a fun and enjoyable time. If you have more questions about staying safe this Halloween, talk to your Methodist Physicians Clinic pediatrician.